You can get cucumbers and enjoy them year-round, but there's nothing quite like garden-fresh cucumbers. Or tomatoes, for that matter. 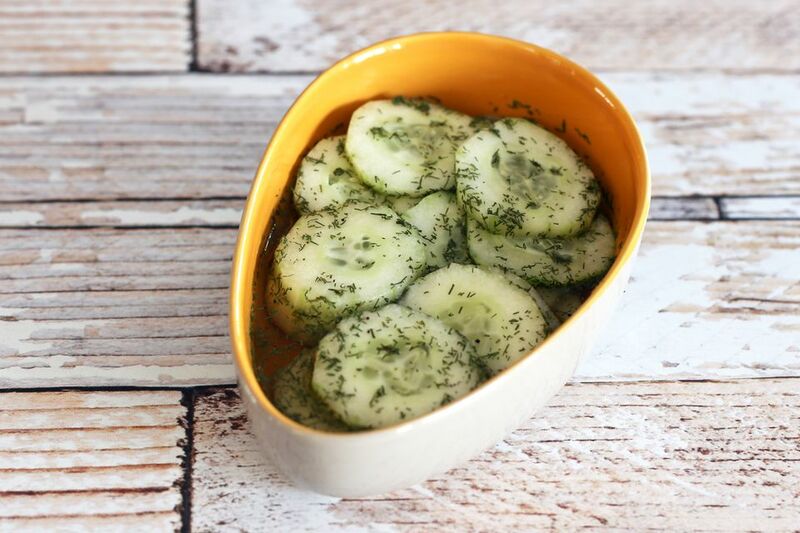 Vinegar and fresh chopped dill enhance the flavor of the cucumbers along with a bit of sugar, salt, and pepper. If your cucumbers are fresh from your garden or the farmer's market, you might want to leave them unpeeled. Take a look at the tips and variations below the for some alternative ingredient additions, substitutions, and seasonings. Peel the cucumbers, if desired. Slice them thinly and arrange them in a serving dish. Combine the vinegar, cold water, dill, sugar, salt, and pepper in another bowl; pour the marinade over the cucumbers. Cover and refrigerate the cucumbers for 2 to 3 hours before serving. The most common cucumbers for slicing are European or English cucumbers. Japanese cucumbers are also excellent for slicing. They are crisp, sweet, and the seeds are small. Like the English and European varieties, they are marketed as "burpless." Replace the sugar with a bit of honey or a sugar substitute. Add about 1/4 cup of chopped red onion or sweet onion to the cucumbers. Omit the dill and add 1/2 teaspoon of celery seeds. Greek-style Marinated Vegetables: Replace the dill with 1 teaspoon of dried oregano and decrease the sugar to 1 or 2 teaspoons. Add about 1 to 2 cups of cherry tomatoes or diced slicing tomatoes, a handful of ripe olives, 1 cup of chopped bell pepper, and 1 cup of crumbled feta cheese. Add about 1/2 cup of olive oil to the vinegar and toss with the vegetables. Cut 2 tomatoes into thin wedges and add to the cucumbers with the marinade. Stir gently to coat with the marinade. Or add several cherry tomatoes or grape tomatoes, halved if desired. Or slice a handful of grape tomatoes in half and toss with the cucumbers.